Necco has some of our all-time candy favorites, so it’s only natural that we love their Halloween candy. That’s why we recommend sharing it with your kids! While we love newer candy, you can beat retro Halloween candy. Here are three Halloween versions of classic Necco candies that you should definitely introduce to their Halloween candy haul this year. There’s something everyone will love in a package of Necco Wafers! Each wafer has its own flavor ranging from fruity, cinnamon, wintergreen, licorice, and chocolate. These Halloween candy packs are all dressed up for the occasion too making them more fun to try. If your trick or treater loves anything peanut butter, then they’ll probably be a fan of these Mary Jane candies. Whether they choose the Peanut Butter Kisses or the original Mary Jane candies with molasses, they’re sure to get a sweet and very peanut buttery surprise. They’ll also love how chewy these candies are. Be sure to try these and other retro Halloween candy with your family for a delicious and festive time. 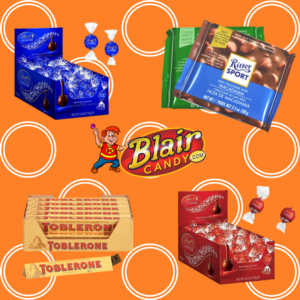 There’s plenty of retro and new Halloween candy for you to pick up at BlairCandy.com. Grab yours today before the Halloween rush! Bite sized Reese’s cups make great spiders! These Halloween peanut butter spider cookies are too cute to eat. See the recipe on Mommy Musings here. You can’t drink witches’ brew without a cupcake. These Witch Hat cupcakes make the perfect pairing. Oreos, icing, and Hershey’s kisses make a perfect pointed hat. Check out the recipe on Tastes Better from Scratch here. S’mores are always a delicious treat! Make Halloween brownie s’mores with these Ghost Peeps. They make a great topping for these spooky treats. See the recipe on Home is Where the Boat Is here. Piñata cookies are a super cool treat to surprise your guests with. These filled caldron cookies are sure to do the same. This recipe may take a little longer than the others, but it’s perfect for all of that super small candy. See the recipe on Hungry Happenings here. 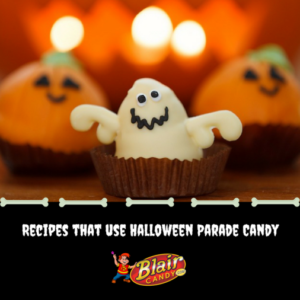 What will you make out of Halloween parade candy? Be sure to tag us on social media when you’re done with your creation. Happy candy crafting! Frooties are a classic, chewy candy by Tootsie Roll. They come in tons of flavors, like grape, chocolate, and cherry limeade, making them perfect because there is sure to be a flavor for everyone. Did we also mention having a bunch of them makes your candy bowl look really colorful? Fun sized, or mini candy bars are a must. While fruity treats are nice, everyone wants to find come chocolate in their candy haul. We recommend the classics such as Snickers, Reese’s, and M&M’s for your parade or event. These are the candies that are most popular! Finally, have some novelty candy on hand. These can be a great surprise because of how silly or spooky they can be. For a less scary treat, consider candy corn or candy pumpkins. Or, if you’d rather have something spooky, consider peanut butter eyeballs or chocolate skulls. 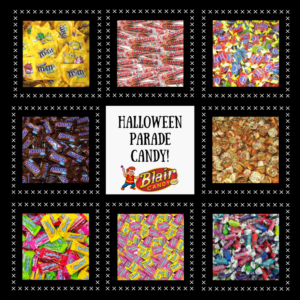 Stock up on your Halloween parade candy today to make sure you have plenty for your parade or event! Having a mix of candies like these on hand can make your Halloween celebration more special. Check out our parade candy selection today for a great mix of your own. White Chocolate M&M’s: The same M&M’s you love with a white chocolate center. Mix with classic M&M’s and have a chocolate feast. These aren’t one of their special edition flavors, so you should be able to enjoy them for a while. Hershey’s Cookies & Cream Bar: This is what most people think about when they think about white chocolate candy bars. This white cholcoate bar is packed with cookie pieces for the ultimate treat. Which white chocolate candy bar do you love? 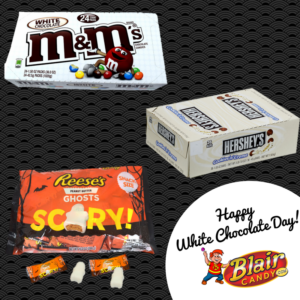 Be sure to keep the celebration going with our huge selection white chocolate candy in bulk. From classic treats to new concoctions, there are plenty of white chocolate candies to go around. Shop these and more by visiting BlairCandy.com today! Stay stocked and save money. Buying the things you use frequently in bulk has been shown to save you a bit of money in the long run. Avoid paying the price every time you need a new pack of gum and keep your pantry stocked. Keep some gum everywhere. You pretty much chew gum everywhere, so why not have a pack wherever you go. Car, purse, desk, gym bag…the possibilities are endless. Be able to share more often. What happens when you open a pack of gum around your friends? You always are asked to share! You’ll feel a little better and more obligated to share when you know you have extra sitting at home. So what are you waiting for? Keep your pantry stocked today with chewing gum in bulk and never go without your favorite gum. 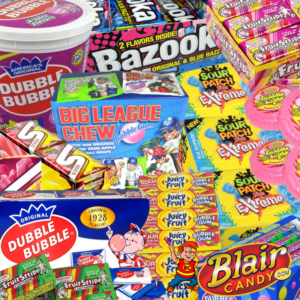 Visit BlairCandy.com today to see what gum we have in bulk and order yours today! What candy is fun to play with and eat? Airheads candy! There are tons of things you can do with this moldable, flexible candy before you eat it. Here are a couple projects you might want to try next time you have a couple Airheads. You have a freshly baked cake…but you want to decorate it differently. Try molding your airheads into fun shapes, textures, and things and sticking them to your cake! We love this Chewy Candy Flower Cake by The Cake Blog. Check out the recipe and the tutorial here. Know someone who loves Snoopy? This Airheads candy craft might be a little difficult, but an adorable, edible Snoopy is pretty worth it. Check out the tutorial on how to make this famous pup and his red house on the One She Two She blog here. If you have a lot of colorful Airheads and cookie cutters, then you have to try this craft. Weave different colored Airheads and cut with your favorite cookie cutter for a cool looking treat. This is a great way to entertain your teens and tweens on a rainy day. Check out this craft on the Ever Clever Mom blog here. Have you tried molding your Airheads candies into unique treats? Be sure to show us your creation by tagging us on social media. 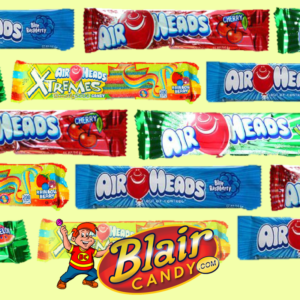 If you haven’t, get started today by visiting BlairCandy.com and order some Airheads today! Halloween Popcorn Balls: These are a classic fall treat! Popcorn balls have all of the crunchy, sugary, and salty flavors that trick-or-treaters are looking for in their treat bags. They’re individually wrapped and ready to hand out. Cotton Candy: Everyone loves cotton candy, so these will be a hit with trick-or-treaters. Make your house the one to stop by with a bag of classic or flavored cotton candy. Charms cotton candy in particular is peanut, gluten, and fat free. This is a great option to make sure kids with certain allergies are included in the fun. Mini Water Bottles: If you plan on handing out candy, but want to add something extra for trick-or-treaters and their parents, mini bottles of water are a great option. Make sure they’re refreshed and ready to get more candy around the neighborhood by sticking a cooler in front of your door. 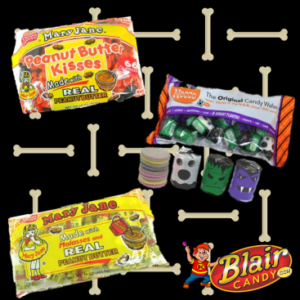 There is plenty of Halloween goodies for you to mix and match on BlairCandy.com! Try combinations like Halloween Popcorn Balls, traditional chocolate Halloween candy, and so much more for a delicious holiday. Check out the full stock today to plan your candy haul. Ritter Sport: This chocolate bar is so much more than the standard chocolate bar. It comes in tons of flavors, including some filled with nuts, marzipan, and other delicious fillings. They also have long history of being expert chocolatiers. See our previous blog on their history here. Toblerone: The name of this chocolate comes from the chocolatier’s family name and the Italian name for nougat. This chocolate bar has an odd shape too, which has been debated by fans for years. Some say it was modeled after the mountains while another says it was modeled after a formation dancers made in Paris. Either way, this chocolate filled with honey and almond nougat is pretty delicious. Lindt: This delightful, melt in your mouth chocolate has been around since 1845. Beginning in Zurich, it’s been an innovative force when it comes to chocolate and is now sold in more than 80 countries. This brand also has a lot of different flavors, so be sure to take advantage! Check out these and other international finds at BlairCandy.com today! We’re a wholesale candy supplier that is always adding new things, so try something new and celebrate International Chocolate Day. Have you had a certain piece of candy and instantly wanted another? Our candy in bulk can help with that problem! We have all of the classics and best selling candy bars that you can normally find in bulk, but what about that harder to find, specialty candy? We have you covered there too! These are just a few candies we carry in bulk that are hard to find. Chocolate Rocks: So realistic and so delicious. This 5 lb. bag of chocolate rocks is great for themed desserts and parties. They’re just as good to eat alone too. Jawbreakers: These jawbreakers could do some damage. Choose from the classic jawbreaker or the jawbreaker that has a gum center. Sour Cola Bottles: These cola bottles have been a gummy candy delight for years. Choose from sour cherry or sour blue raspberry for a sweet and sour treat. Jordan Almonds: This classic wedding candy is ready for the ceremony. Make sure you have enough of this multi colored candy for your tables, candy buffet, and even some favors. There’s plenty of candy in bulk to go around. 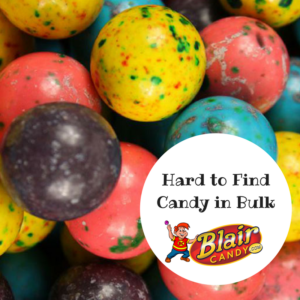 Be sure to stop by BlairCandy.com to see if your favorite candy is available in bulk. Chances are it is and you’re ready for a really sweet treat. Introducing Halloween Peeps with Fall Flavors: And Recipes! It’s weird to think of Peeps as just an Easter candy since they’ve expanded into other holidays over the years. 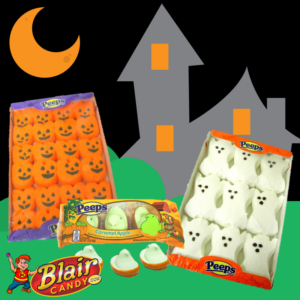 Blair Candy keeps up with all of the new Peeps, so we have new Halloween Peeps to introduce to you. From the classic sugary marshmallow to new fall flavors, there’s plenty of Peeps to go around! If you are just looking for the classic, marshmallow Peep, we definitely recommend the Peep pumpkins, ghosts, or monsters. These Halloween Peeps are the same consistency as the Easter bunnies and chicks and have the sweet, sugar coating on them too. These are also great to decorate Halloween dessert crafts with. If you’re looking for a novelty candy for the holiday, then you should try the fall flavored Peep chicks! They come in candy corn, caramel apple, and pumpkin spice to capture the season. Each of these Peeps are also dipped in caramel or white chocolate for another layer of flavor. 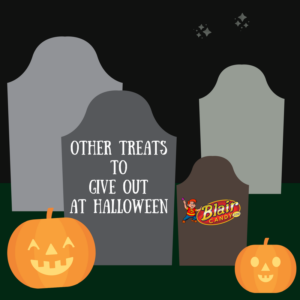 There is plenty of fall and Halloween candy up for grabs right now on BlairCandy.com. Be sure to get yours today before everyone else gets them and supplies run out.